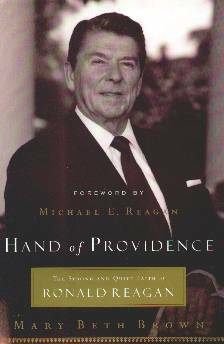 Author Mary Beth Brown wrote this book about Ronald Reagan so that we, the public, could get to know a different side of the 40th president of the United States. His private and personal Christian faith, she says, is what accounted for his success. A very popular president and with his every move predaciously recorded, very little was known about this man's profound belief in God. President Reagan credited his mother and her strong faith and believed she instilled in him the strength he had during his life. A life that nearly ended after just weeks as the new president - by a bullet fired by one John Hinckley, Jr. - on March 30, 1981. Mother Nelle encouraged her sons Neil and "Dutch" (as Reagan was known as a kid) to understand the importance of faith and they went to church regularly. They were also read to and Ronald Reagan learned to read at age five and never lost the love of reading books. Nelle had an air of the theatrics about her and when she could, she acted a little here and there and convinced a nine year old Reagan to take to the stage with her. For years afterwards, his mother's strong influence (moral as well as religious) and his father instilling a good work ethic, taught the boys the value of working hard and saving, even though he himself was an alcoholic and was always changing jobs. This was something Reagan took with him throughout his life. This is a brief history of the man Ronald Reagan became and who went on to become America's 40th president. It also relates a concise history of his achievements, with this faith leading the way. Reagan died in June 2004 at the age of 93. Conclusion - A nice look at the man who made a difference in the world.